Product Packaging | CS Packaging, Inc. There is no denying that the rise of online business, or e-commerce, has changed the face of shipping. Gone are the days of mail-order catalogs or TV call-in orders when companies could give a vague “four to six weeks for delivery” and there wasn’t anything customers could do about it, including even track their package. But now, things have changed and we have – along with package-tracking – faster deliveries, better options for returning a package, more streamlined shipping services and even drones delivering packages with optimum efficiency. So what does this mean for your online business? Mostly, it means having to adjust your business model to a customer base that has gotten use to two-day delivery as well as more dynamic and efficient packaging of their products, as well as accounting for and taking the hassle out of returns. Shipping can make or break a sale in the world of e-commerce, depending on if the shipping prices are considered exorbitant or not quick enough for their liking, leading to one of the worst enemies of online retail: shopping cart abandonment, when the customer goes so far as to put a product in their cart but leaves the site before completing the purchase. Shipping can be, and often is, the thing that makes or breaks a sale. First off, you need packaging for your products, which, since you are not Amazon.com, is where we at CS Packaging come in, with a whole catalog of packaging products – more than eighteen thousand! – that go above and beyond what you would expect at your typical packaging retailer. We can also help with making sure your packaging is dynamic and distinctive with printed cartons and specially-made packages for specific items, like molded pulp trays for long-necked bottles. We also have superior protective packaging for fragile items. CS Packaging is your one-stop shop for your shipping product needs. Once you’ve acquired all the components you need to ship your product, you need to look at all the mitigating factors of your shipping process. One is packaging size, while you do want to be distinctive to your brand, you also want to be efficient about size, use as little of it as possible, as this will offset shipping costs, in short, package for safety and density and avoid unnecessary large packaging. Another major factor is customer expectation for free shipping and delivery times. Online retailers should have a clear and easy to understand shipping policy available on their site that tells customers everything they need to know so there’s no misunderstandings, and establish firm guidelines based on what you can realistically achieve. Make sure that your products are real-time trackable once they have shipped, as this not only lets the customer keep track of it, but also ensures that you are not liable for any issues or errors that might occur once your product has left your business. This is just a quick overview of the things that online businesses need to keep in mind when shipping their products out to customers. The world of e-commerce has changed shipping out products in so many ways, largely very much for the better. But it also means that customer’s expectations have changed with it and that means that online retailers have to work harder and smarter to be able to meet them. Luckily, CS Packaging can at least ensure that your packaging needs are met with items of superior quality and reliable service so you know you’re sending your products out in the most efficient and top of the line packaging. As a warehouse manager, VP of operations, buyer, purchaser, or procurement official, you understand the critical importance of using strong packaging materials when shipping product to customers. If the product arrives in good condition, everyone is happy and nobody thinks about the packaging. 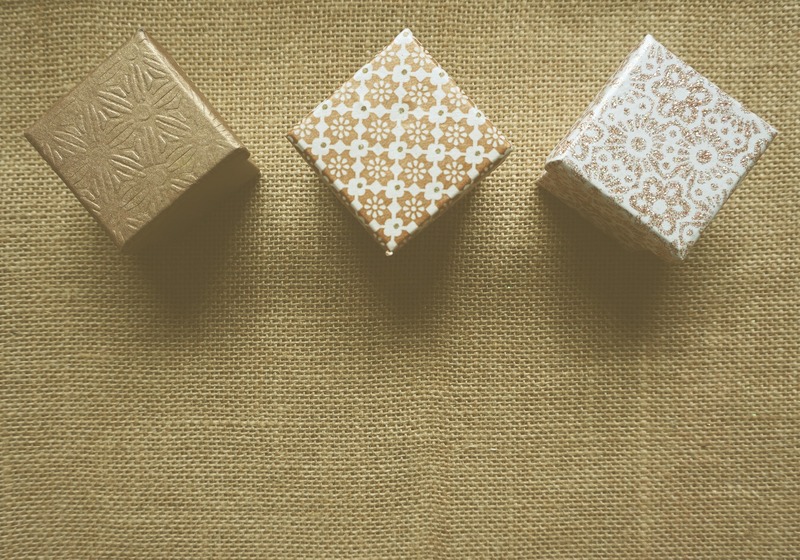 Choosing the right box is often the first step in protecting your product. But, if the product arrives damaged, however, every part of the shipping process is closely inspected to find a reason for the failure. Sometimes a failure to protect the box contents is due to using the wrong packaging supplies. Although boxes can be used to ship everything, using a poorly reinforced box can lead to disastrous shipping results. It is crucial for the buyer to carefully choose packaging so that the entire process will flow smoothly. Surprisingly enough, there are certain elements of engineering that go into the design of boxes and packaging elements. One of the simplest, but most effective, forms of protection is corrugated flutes. 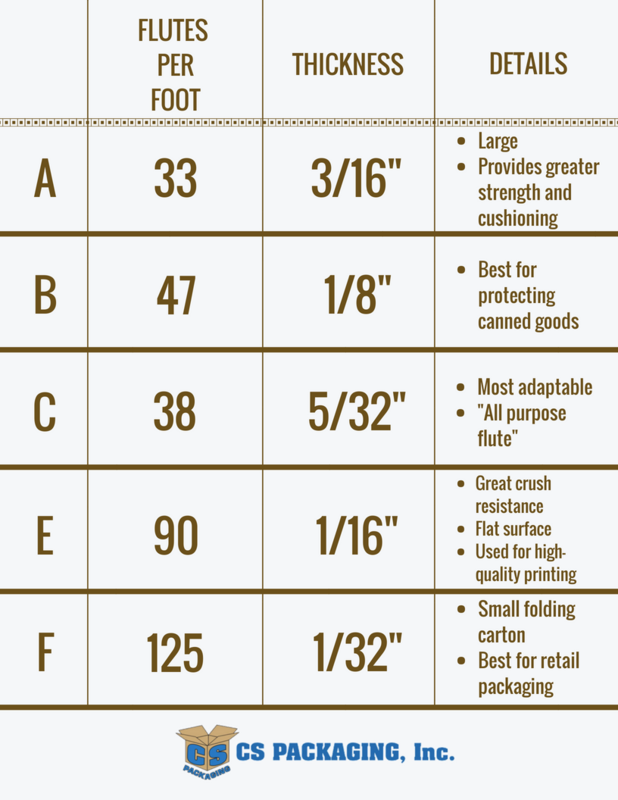 Instead of just using a cardboard separator that does not provide ample protection or support, packaging designers have found that the best way to increase fiberboard strength is by adding wavelike arches, or flutes, between the two linerboards. If pressure is applied to the side of the board, space between the flutes serves as a protective cushion for the container’s contents. Once these flutes are properly anchored to the linerboard with a strong adhesive, they resist pressure and bending from all directions, and increase the likelihood of a safe product delivery. Not only do they form rigid columns which can support a great deal of weight, corrugated flutes can also act as an insulating agent to protect the contents from extreme temperature variations. A Flutes: This flute profile has about 33 flutes per foot and is 3/16” in thickness. Its larger size generally provides greater strength and cushioning. B Flutes: With about 47 flutes per foot and 1/8” of thickness, this size flute is perfect for protecting canned goods. C Flutes: At about 38 flutes per foot and 5/32” in thickness, this is generally considered the most adaptable, all-purpose flute. E Flutes: This size has about 90 flutes per foot and is 1/16” in thickness, giving it a greater crush resistance and a relatively flat surface which can be used for high-quality printing applications. F Flutes: This flute has about 125 flutes per foot and is 1/32” in thickness. It was developed for small folding carton type boxes, and is perfect for retail packaging. The printout below is meant for you to keep on hand for easy referencing — making ordering shipping supplies easier than ever before. Don’t forget: Flutes can also be customized to ensure optimum safety of your product during transit. For more information about custom flutes, give us a call! A packaging expert is always happy to chat. No matter how strong your product is or how skillfully your marketing is implemented, your customers’ opinions of your brand rest in one place: logistics. Getting their order in one piece, well-presented, and on time is crucial to the continued success of your business, but what’s the best way to make that happen? While you have several options, most growth-oriented modern businesses opt to contract the services of a third party logistics provider, or 3PL. Not only does a full-featured 3PL handle the headaches of warehousing and storage of your product, they also get it packed, shipped, and tracked on behalf of your company. What’s more, some can even handle returns, often called “reverse logistics,” for your company at the same time. They are an incredibly powerful ally in a very competitive market, so if you’re considering one, it’s important to do your research before signing a contract. After all, they’ll be handling your storage, packing, shipping, and overall fulfillment cycle, and the more volume your company moves, the more you’ll need to rely on their expertise. This method offers full control and oversight offset by full responsibility and maximum versatility. Your company sources its own warehousing space, creates relationships and accounts with shippers, hires and manages its own staff, and can change virtually anything except warehouse location (due to contracts) at any given time. Many companies with experience in their corner outgrow this method or find that it takes considerable resources away from operations elsewhere in the company. Newer companies often optimistically start with this method, but quickly find themselves overwhelmed by volume or the nuances of operating a warehouse successfully. This method offers partial control and minimal responsibility with customization options ranging from pricing structure to contract length. They typically bring an existing warehouse space to the table, as well as their own privately hired and managed staff. They extend their existing relationships with shippers to their clients, allowing fast adoption and fast results from the partnership. This method offers virtually no control or customization beyond superficial means – a brand name or logo on an in-box invoice, for example. Unless your company is only carrying a handful of items with no plans to expand your offerings, this method will quickly feel restrictive and will become an obstacle to the development of your branding. Your company will have little to no oversight when it comes to warehouse staffing and management, where products are stored, and how products are handled, packed, and shipped. Signing up for 5 or more years in a static location is a nerve-wracking proposition for a company just starting out, or one eyeing expansion – of either the sku or geographical variety. If your business tends to fluctuate seasonally, securing your own warehouse space would otherwise mean either overstuffing your warehouse in cycles or wasting budget renting empty space in the off-season; 3PLs typically offer considerably more flexibility to expand, and often to shrink as well. Many businesses underestimate the challenge of finding, interviewing, training, and managing labor for their warehouse, to say nothing of the expense of liability protection. Warehouses can be dangerous for staff with inadequate training, or inattentive management – a 3PL usually keeps several clients, a practice which allows it to collectively shoulder that burden and still profit. To put it plainly, your business makes, manufactures, or markets products, and none of those products are logistics services. The more time you spend learning “the hard way” which shelves work best for your stock, how it should be rotated, and the best shipping methods to use, you’re not only out that “experimental capital,” you’re also out of the time, energy, and staffing it took to get you to that position. Logistics providers like UPS or FedEx have an interest in seeing their customers do well, but they simply aren’t as invested as a 3PL – they have a wide enough customer base that they don’t need to be overly concerned with your success. A 3PL, on the other hand, does have a vested interest in finding the most efficient and cost-effective ways to satisfy your logistics needs. They won’t wade into expensive territory without discussing it with you and weighing all available options – you won’t get a high invoice “sprung” on you the way pure service providers like UPS and FedEx would. When Should I Start With a 3PL? For newer businesses, there’s a high likelihood that self-fulfillment is in place – the longstanding trope of starting a “business out of the garage” continues despite economic fluctuations, even if that “garage” is actually a small local warehouse. Your sales are uneven or cyclical, and your warehouse often seems to be too big or too small. If you’re trying to keep up with your own sales cycles, it’s almost a guarantee you’re paying more than you need to: either in last-minute staffing additions to deal with the crush, or in keeping empty space on hand in preparation for those uneven sales booms. You’re running out of space. While you might be tempted to simply move to a larger warehouse, bear in mind that order volume isn’t purely about skus. When your orders go up, so does your need for reverse logistics, as well as your opportunities for cost-savings solutions you simply didn’t have financial access to before. Trudging forward on momentum rather than research is wasting valuable profit. You aren’t sure how to grow your logistics. If your ad-hoc logistics plan has worked up until now but is showing signs of strain, it’s time to bring in a 3PL. Just the same as an individual doing their own taxes is a world apart from a corporation’s accounting needs, there’s nothing wrong with being so successful you need to outsource! Remember, handling the infrastructure of your business with professional allies just means a stronger foundation for even more growth later. While you’re mulling over your potential growth with a 3PL, don’t overlook what other services can do to strengthen your brand and product perception. Third-party packaging solutions can be connected to your new logistics provider for a potent one-two punch on your competition. This is a particularly smart move if your previous self-fulfillment efforts involved folding, cutting, or arranging your products in custom packaging – moving to a 3PL doesn’t have to mean sacrificing that personal touch. Whether you ask your 3PL for recommendations or source a packaging fulfillment company on your own, outsourcing nuances like this gives you excellent creative control over product presentation without demanding an outsized amount of your valuable research and development time. Pro tip: Find a packaging provider that has experience in your industry; they’ll be more likely to understand your specific packaging needs, from materials, to closures, to required durability, and even regulatory standards. Finding a 3PL isn’t just a line on your to-do list: it’s an important door to open if you’re serious about growing and improving your business. Think of it this way: the taller a building grows, the more support it needs at the base level to stay structurally sound. Handing off your logistics, processing, and packaging needs to a professional service provider gives you that support so that you can stay focused on what really matters: adding more floors to your skyscraper of success. As your packaging production ramps up, so must your processes. Yes, while it may have been feasible to manually complete some tasks when you were growing the company and working with small amounts, automation is often necessary to streamline efficiency as operations grow. Though it may seem like an afterthought, one piece of equipment that can achieve time savings and maximize productivity is a strapping machine. What exactly is a strapping machine? It’s an end-of-line packaging machine that works to fasten a package or pallet of packages. It helps enhance containment, bundle goods and secure loads to pallets. There are two main categories of strapping machines: automatic and semi-automatic. Automatic machines typically integrate and work with conveyors to streamline the strapping process, largely taking any need for an operator out of the equation. Essentially, they detect loads, strap, tighten and cut all on their own. The big difference between automatic and semi-automatic strapping machines is that the latter requires an operator. The role of the operator with a semi-automatic machine involves applying and tightening straps around the application. Semi-automatic machines are better suited for companies producing smaller volumes of product. One of the key benefits to them is that these machines are portable and can be moved throughout the facility, while automatic machines are largely stationary. If you’re manually strapping more than 20 to 25 items per day, then it would likely be wise for your operations to invest in a strapping machine. Every package or good has different tension requirements. One of the nice things about automatic strapping machines is that they come with adjustable tension features to cater to any application. Waste can be an issue when manually strapping, as there’s a tendency to overestimate the amount of material that’s needed for a particular application. Wasted material translates to wasted money. You won’t get much – if any – waste when using a strapping machine, as they’re designed to use only the amount of material that is required. Strapping machines are durable, and it’s generally much safer to have a worker operate one that it would be to have that individual strap manually. You’re only as good as the product you’re supplying, and strapping machines help improve the security of your items as they’re being shipped and transported to their destination. As you can see, strapping machines can play a crucial role in helping to take your packaging business to that next level. Don’t think of this equipment as an afterthought – it can become a key ally in your operation. If you run a subscription service, you know your boxes are a lot more than a means to protect your merchandise from the bumps and jolts of shipping. They don’t just carry stuff. They carry your brand, inside and outside, and custom printed corrugated boxes can do it with panache. The competition is getting tougher in the subscription service industry, but the opportunities are expanding. During the past five years, the subscription market has grown more than 100% per year. The biggest of the services chalked up sales of $2.6 billion in 2016; in 2011, sales were “only” $57 million. Those numbers are awesome — but prove that in order to remain competitive, you need an advantage that your competitors don’t have. For example, eye-catching and intuitive custom packaging and shipping supplies. So how do you grab market share? One way is to customize all your packaging, not just the outside of the box but also the tape, peanuts, tissue, packing paper, protective inserts, and just about anything else that goes with the box. The possibilities for effective customization are practically endless. It’s a matter of knowing what your customer wants, and using imagination to deliver it. The most important thing to keep in mind is that every contact with a customer is a chance to develop loyalty and sales — and your packaging is the first contact they have. If you use protective inserts, they’re probably printable. Depending on the size, you might just print your logo, or your logo and a brief message — perhaps your company tagline or a funny memorable message. Do you sell custom coffee mugs? Foam peanuts can hold a fresh coffee scent. They can also be colored to match your corporate colors or to mimic coffee beans. This is just one of hundreds of unique ways those packing peanuts can be transformed from an annoyance, into something of value for your customer. If your limited edition wood sculpture needs to be padded and stabilized, you might use packing paper. Why not turn the paper into a sales tool by customizing it with your logo and contact information? Not everyone is a creative genius. Many people have terrific ideas that they can’t quite translate into slam-bang great images or messages. If you’re one of them, it’s best to get some expert help. You might not know this, your packaging manufacturer can help you reach your packaging goals with your custom printed corrugated boxes. To bring all of your custom packaging ideas to life, contact Bob and he’ll help walk you through your custom printed corrugated box options.